약 3년 반 전 타 대학병원에서 위암 ESD 후 수술을 권유받았는데 수술을 거부하였던 환자가 몇 년 후 전신 재발 소견에 대한 2차 의견을 위하여 저를 찾으셨습니다. 안타깝지만 도리가 없었습니다. 3년 전인 2013년 인근 의료기관에서 내시경 절제술을 받으셨던 60대 여성입니다. 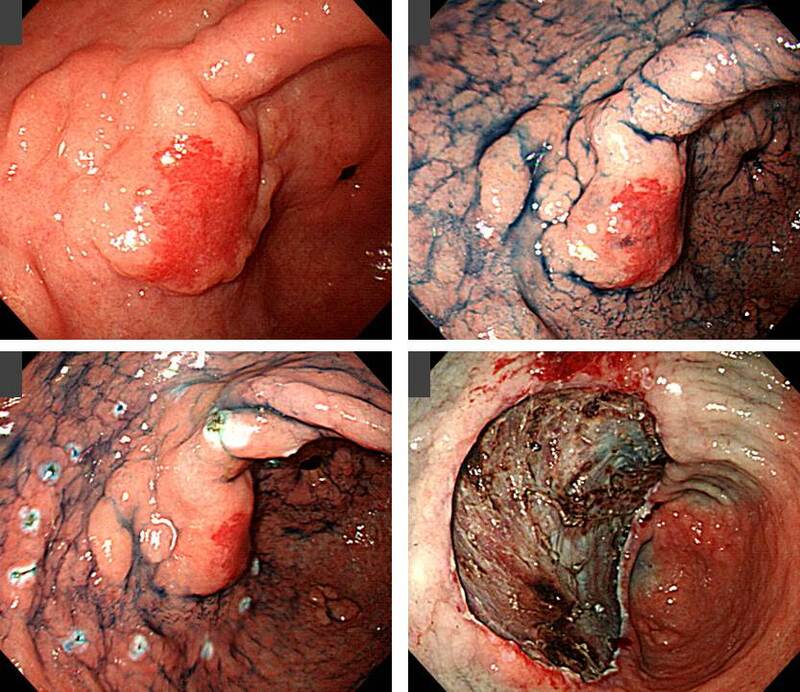 당시 병리결과는 adenocarcinoma M/D (1.7cm) arising in tubular adenoma (HGD), invades submucosa (SM1, 0.5mm), RM (-), L/V/N (-) 였다고 합니다. 병리 결과에 따른 재발 위험에 대하여 어떻게 설명을 들으셨는지, 수술을 권유받으셨는지 알 수 없으나 내시경 치료 3년 후 multiple bone pain이 발견되어 bone scan과 CT 검사를 받으셨는데 다발성 재발로 듣고 2차 의견을 위하여 방문하셨습니다. 최근 내시경을 받으시지는 않았다고 합니다. 비록 내시경 재검은 받지 않았으나 CT에서 위 주변 node가 현저히 커져 있고, 다발성 간전이를 동반하고 있는 모습이 위암의 재발로 판단되었습니다. 안타까운 증례인데요… 시술자의 입장에서는 늘 조심하는 수 밖에 없다는 것을, 盡人事待天命이지만 간혹 재발예가 있다는 것을 통감하지 않을 수 없습니다. 수술이 필요한 환자가 수술을 안 하였을 때 여러분은 어떻게 하십니까? 저는 강력히 다시 한번 추천합니다. 제 외래 EMR 기록 일부를 소개합니다. 2016년 2월 심평원에서 ESD 후 수술이 필요한 환자가 수술을 하지 않았을 때 그 사유를 명확히 밝히지 않으면 적정하지 않은 것으로 평가한다는 지침을 내렸습니다. 말이야 옳다고 할 수 있지만 치료가 적정하였는지 여부가 아니라 단지 입맛에 맞는 의무기록이 있는가 없는가로 적정성 여부를 판정하다니... 마음이 편치 않습니다. 고령이고 쇠약하여 수술할 수 없는 상황도 인정해주지 않는다니 입이 벌어지지 않습니다. 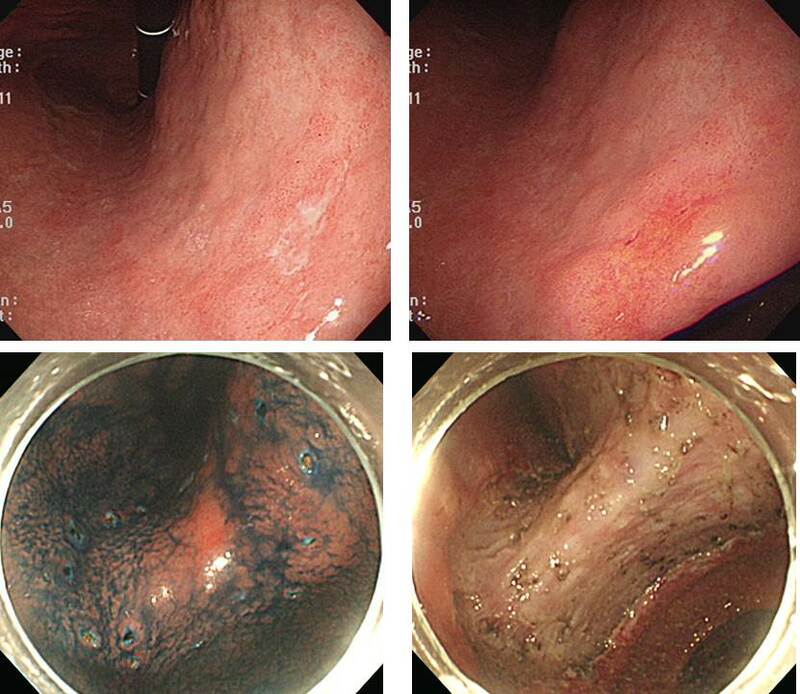 This is the immediate endoscopic outcome. 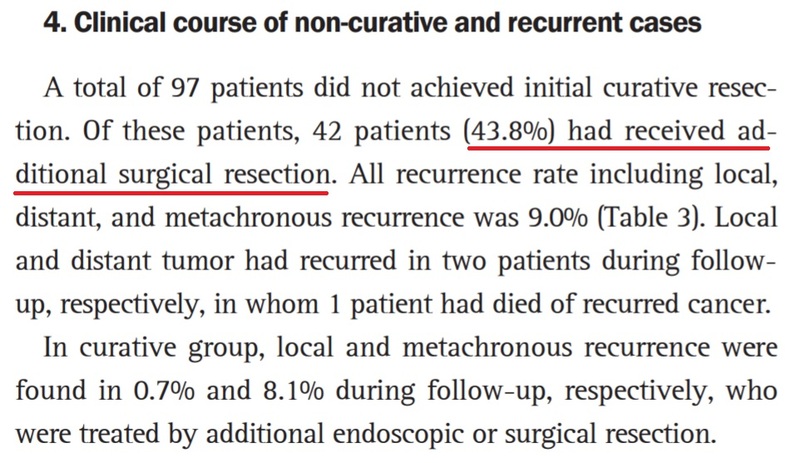 The rate of non-curative resection is 16.7%. 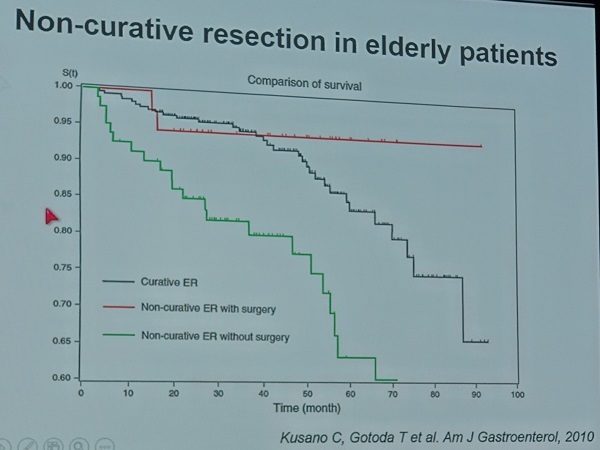 There are two subgroups in non-curative resection. 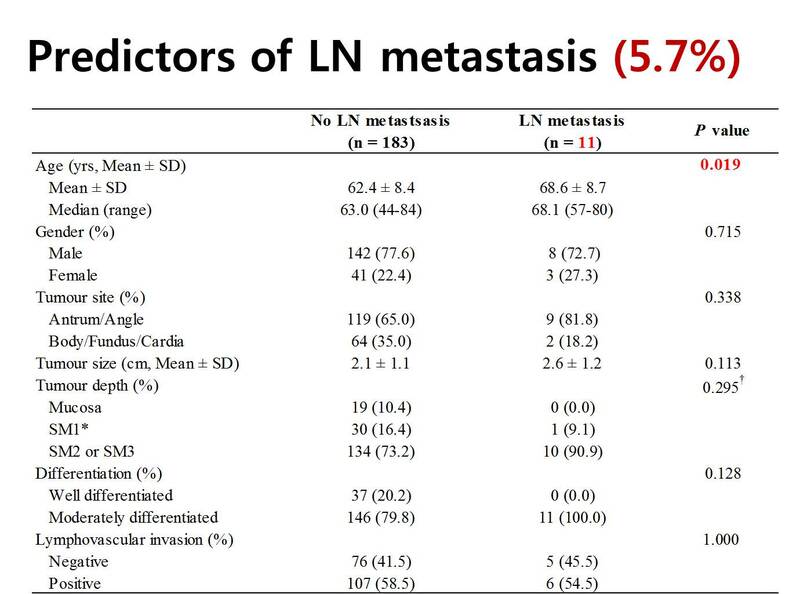 One is lateral margin positive only group, and the other is cases with risk of lymph node metastasis. 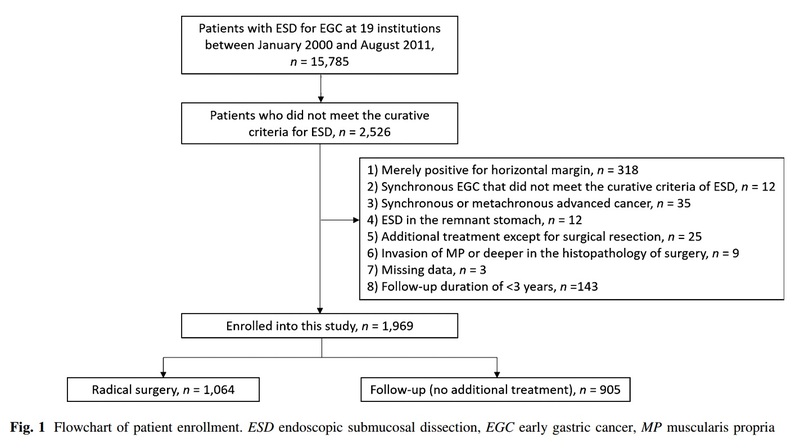 Lateral margin positive cases were excluded in this study, because most of them are treated by additional endoscopy. 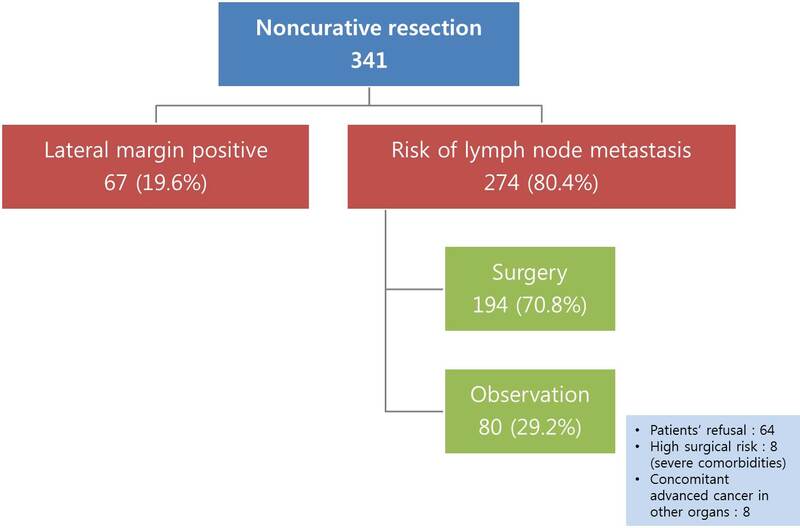 In cases with risk of lymph node metastasis, 70% were operated, and 30% were observed without surgery. The main reason of observation is patient’s refusal to surgery. And have bigger tumor. 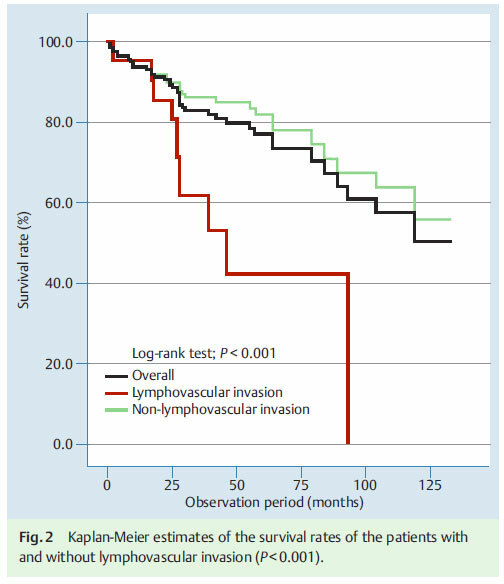 The rate of lymphovascular invasion was higher in the surgery group. 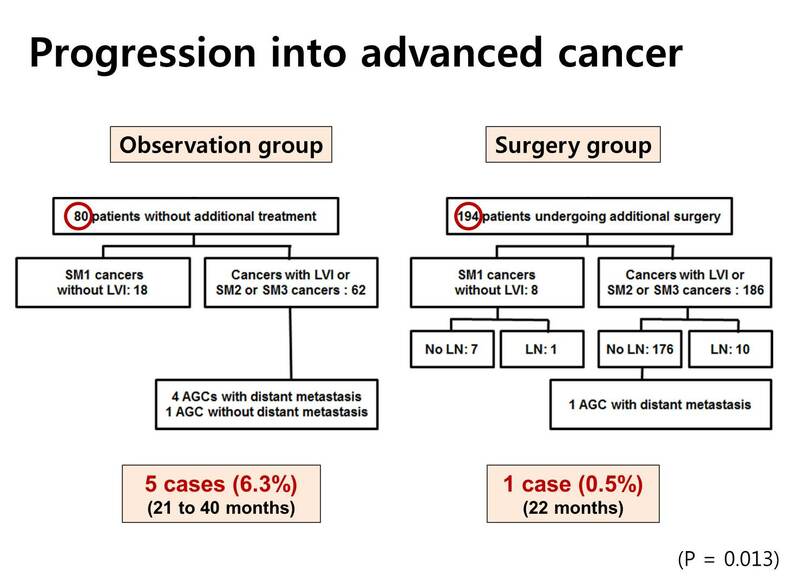 Rate of progression into the advanced cancers were different between 2 groups. 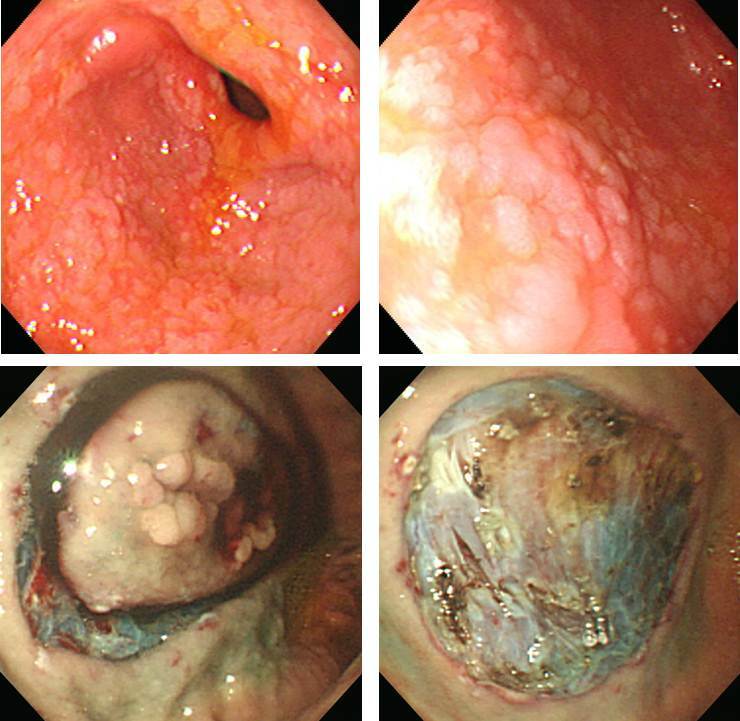 Five advanced cancers were found in the observation group, and only one metastatic disease was found in the surgery group. This difference - 6.3% versus 0.5% - was statistically significant. 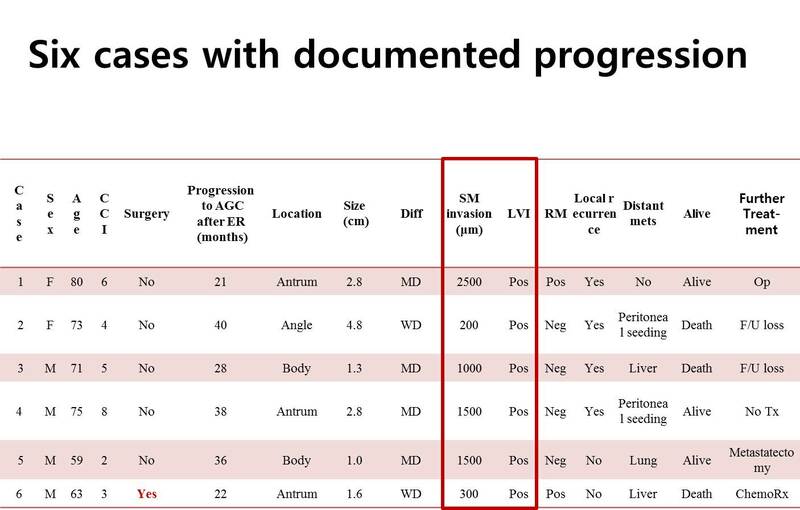 This is the summary of six cases with documented progression of gastric cancer. 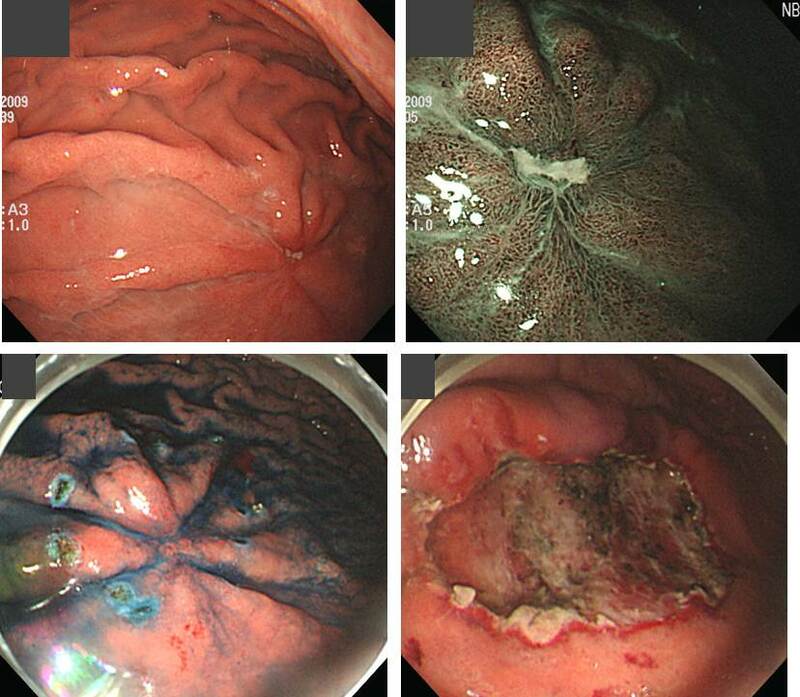 As you can see, all cases have submucosal invasion of more than 200 micrometer and all have evidence of endolymphatic invasion. The next two slides are the main findings of this study. We compared the overall survival by some factors. 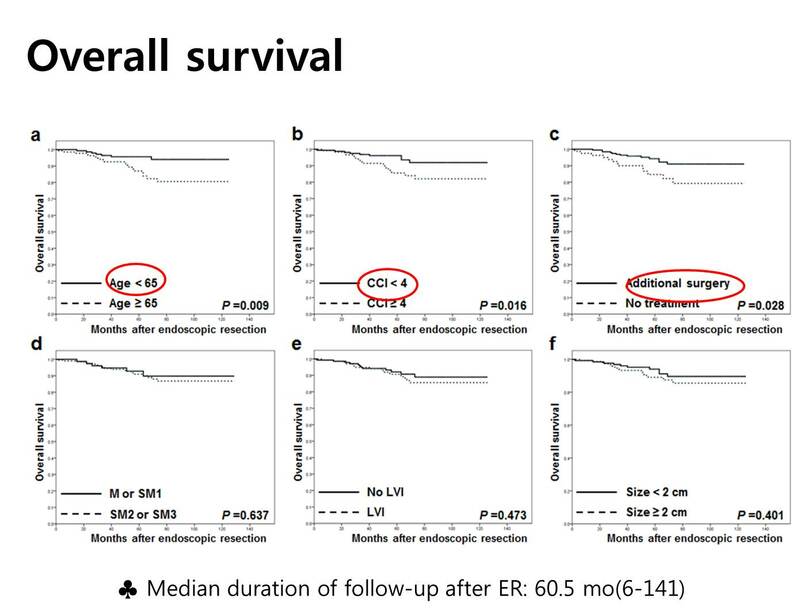 As you can see in the figures, age less than 65, low Charlson score, and additional surgery were related with longer survival. 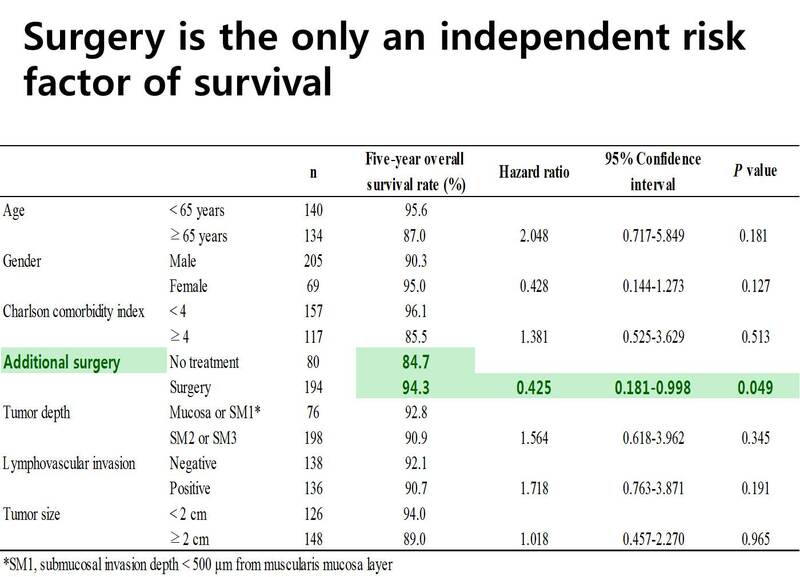 In the Cox proportional hazard model, additional surgery was the only significant independent factor related to the longer survival. 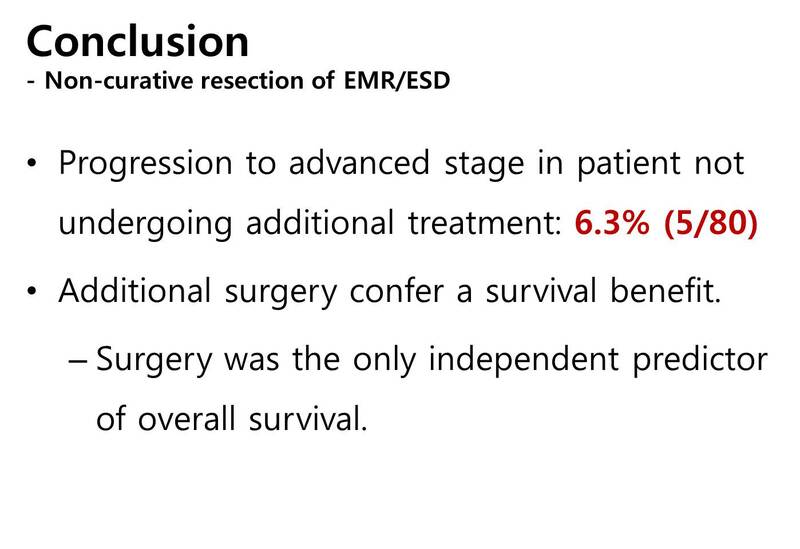 So surgery was beneficial for patients with non-curative resection after ESD. 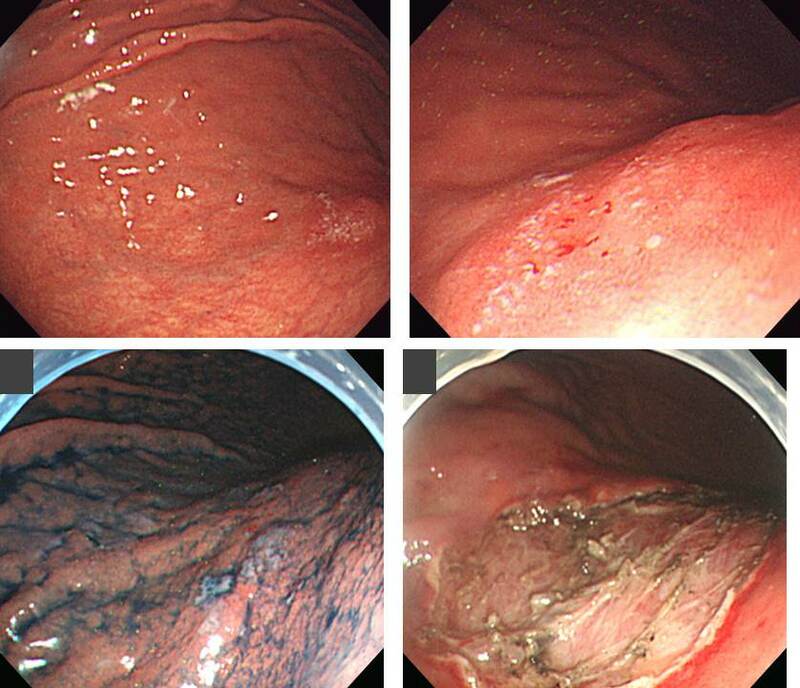 This is the initial endoscopy of the six cases. Some are elevated, some are depressed, and some are flat. There is no uniform characteristics. Ladies and gentlemen. 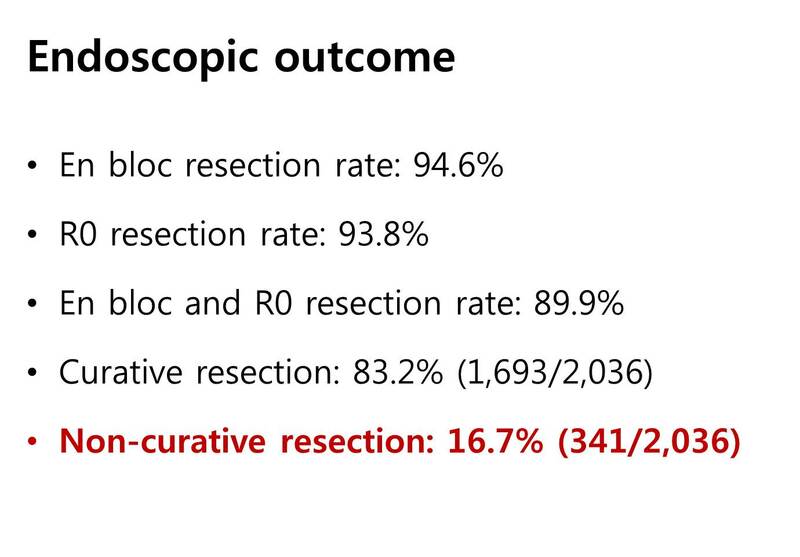 I’d like to conclude my presentation by saying that progression to advanced stage in non-curative resection without surgery is at least 6.3% within 40 months. 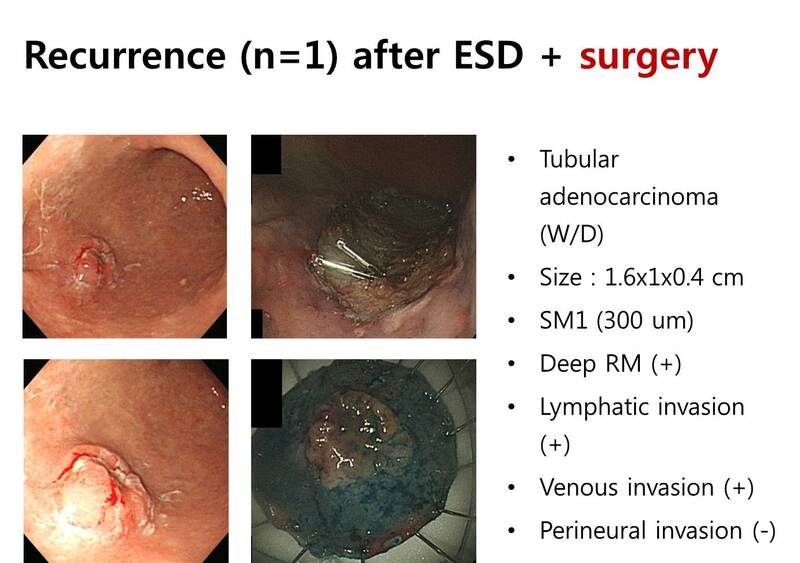 In this setting, additional surgery confers a survival benefit and should be positively considered. From now on, I’d like to show you some of the interesting cases. 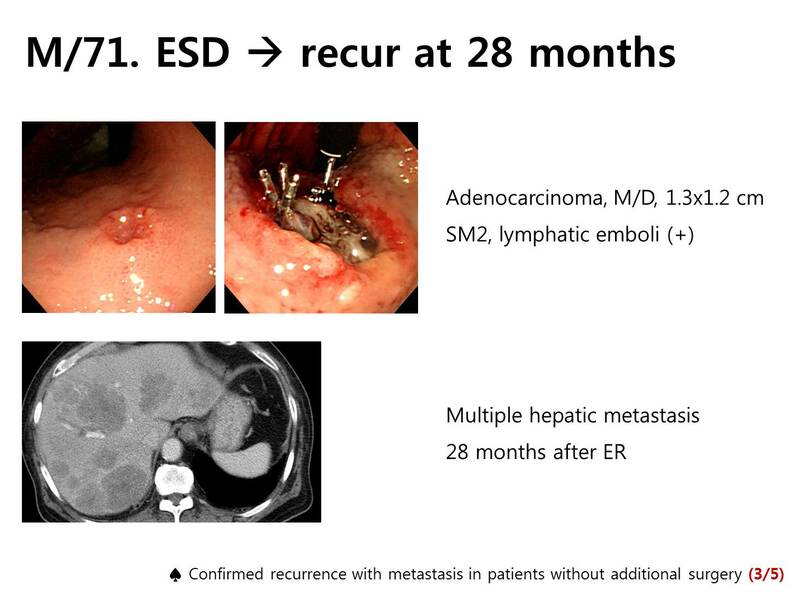 The patient refused surgery, and multiple hepatic metastasis developed 28 months later. The next case is very similar. 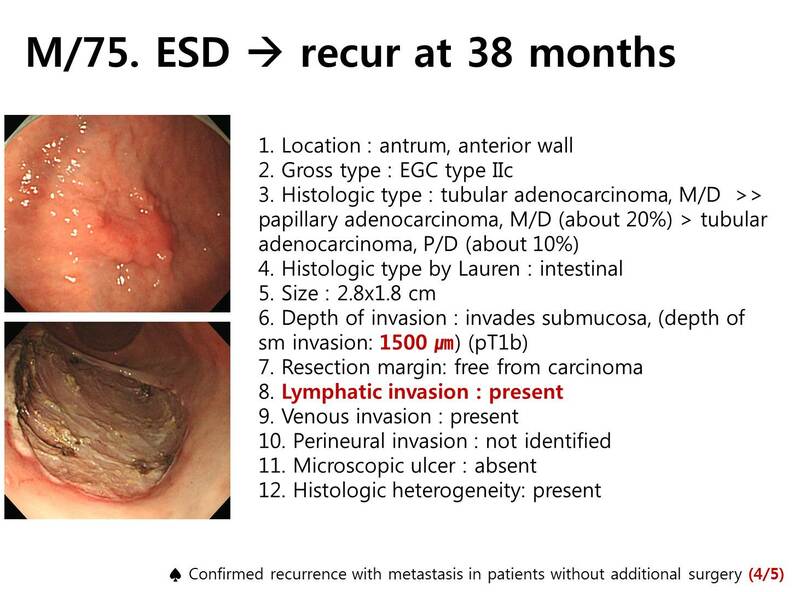 Advanced gastric cancer was found 38 months later. 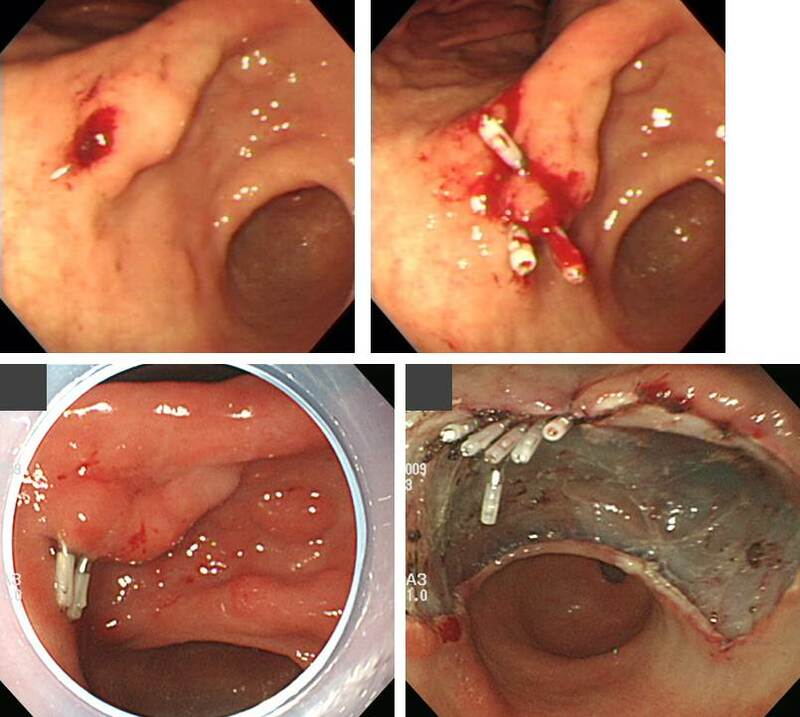 Subtotal gastrectomy with lymph node dissection was done. 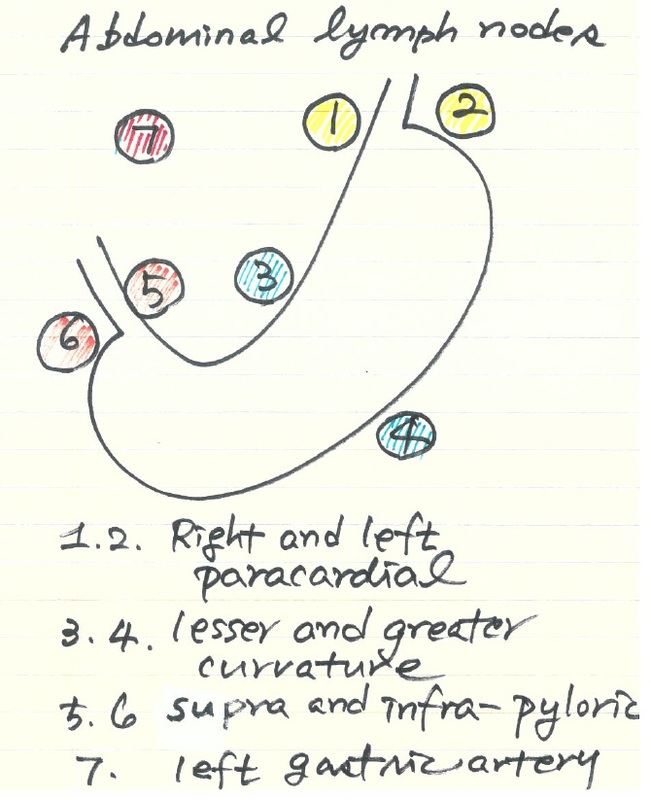 Depth of invasion was subserosal layer and one lymph node was involved. 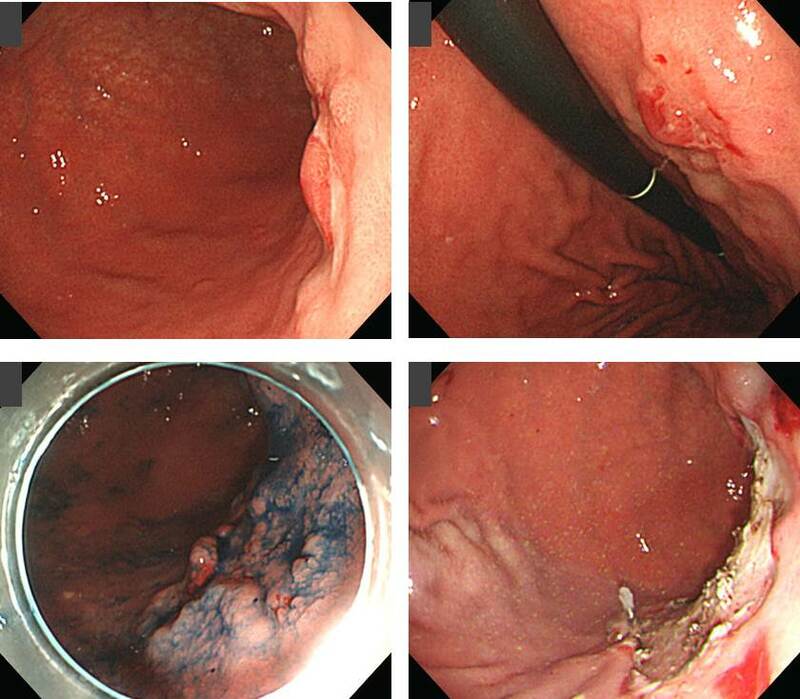 However, peritoneal seeding was found during the follow up. 수술하지 않고 경과관찰 중 progression을 보인 5명의 사진입니다. 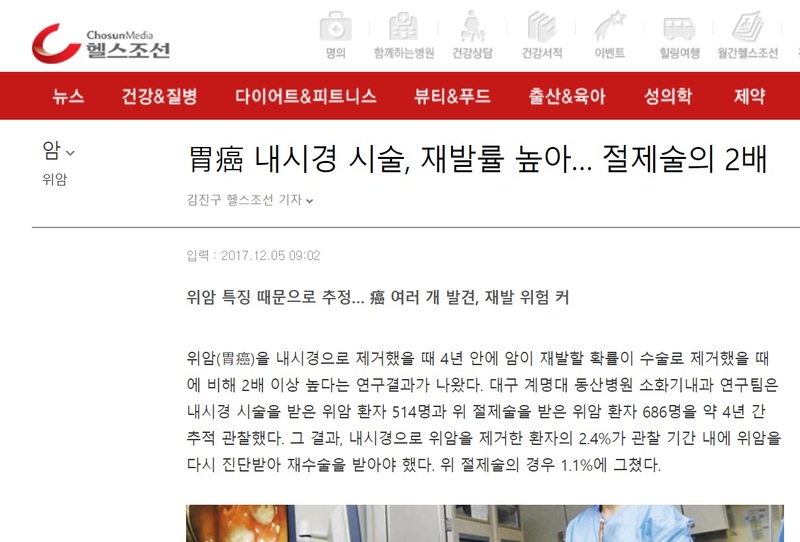 우측 하단 박스는 수술하였음에도 불구하고 multiple metastasis로 recur한 환자입니다. 이들 모두 ESD candidate 선정 과정에서 다소 욕심을 부렸던 경우라고 생각됩니다. 조기위암 내시경 치료 후 수술이 필요한 환자에서 수술 후 림프절 전이가 확인되는 경우는 10% 내외입니다 (Kim ER. Br J Surg 2015). 저희 기관에서는 수술이 필요한 환자 274명 중 194명(70.8%)에서 수술을 시행하여 local residual cancer가 있었던 환자가 10명 (5.2%), 림프절 전이가 있었던 환자가 11명(5.7%)이었습니다. 아래는 림프절 전이가 있던 11예의 사진입니다. 조기위암 내시경 치료 후 약 10-15% 환자는 수술이 필요하다는 결과가 나옵니다. 수술을 해야 합니다. 일부에서 이미 림프절 전이로 나오기 때문입니다. 한 병원에서 ESD 치료를 받기로 한 환자였는데, 그 병원 간호사가 파업을 하는 바람에 치료를 받지 못하고 저를 찾은 환자였습니다. 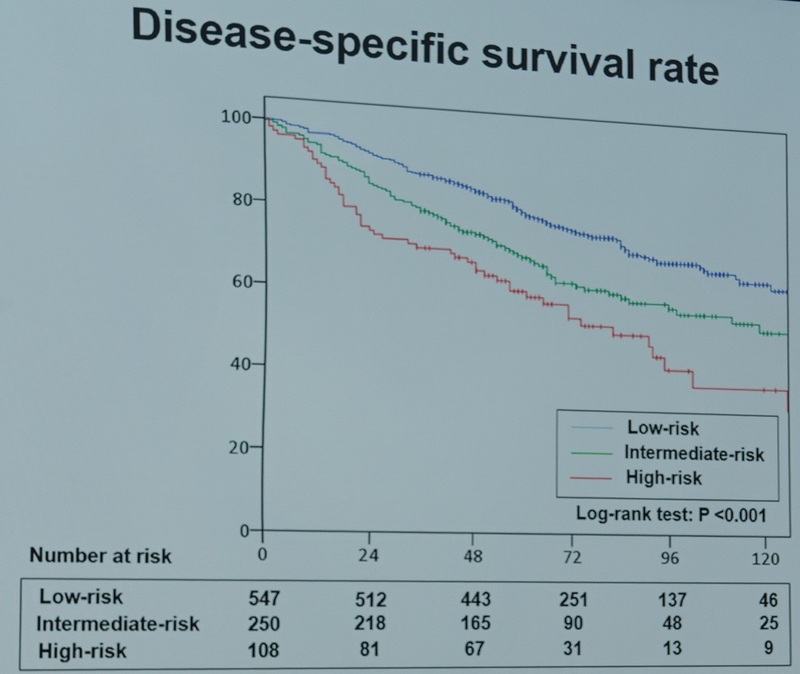 시술 전 조직검사는 moderately differentiated adenocarcinoma였습니다. ESD를 했습니다. 아래와 같이 설명하고 수술을 권하였습니다. 4번 림프절 전이가 있었습니다. 수술이 필요하다고 나오면 수술을 한다. 끝. 모두 다 외울 수 없지만, 1부터 7번까지의 림프절 위치와 이름을 알고 있으면 여러모로 도움이 됩니다. 생각보다 어렵지 않습니다. 좌우 짝(pair)으로 되어 있으니까. 앞서 언급드린 바와 같이 조기위암 내시경 치료 후 수술이 필요한 환자에서 수술 후 림프절 전이가 확인되는 경우는 10% 내외입니다. 곧 논문으로 발표될 예정입니다만, 저희 기관에서는 수술이 필요한 환자 274명 중 194명(70.8%)에서 수술을 시행하여 local residual cancer가 있었던 환자가 10명 (5.2%), 림프절 전이가 있었던 환자가 11명(5.7%)이었습니다. 아래는 local residual cancer가 있던 10예의 사진입니다. 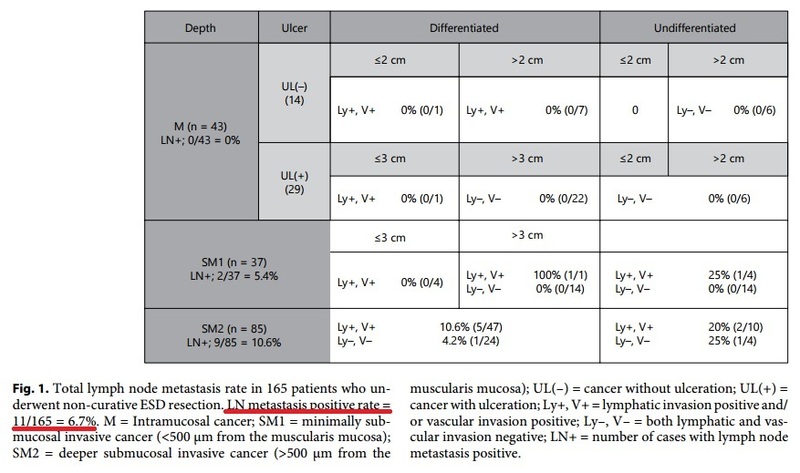 Noncurative resection 중 undifferentiated-type 48명을 제외한 differentiated-type 285명 중 126명(44.2%)에서 추가치료가 시행되었고 159명(55.8%)은 경과관찰을 하였습니다. 경과는 다양하였습니다. 위암으로 사망한 사람은 세명이었습니다. 이 세명에 대한 사진이 있었더라면 참 좋았을텐데 무척 아쉬웠습니다. 예상된 일입니다만 lymphovascular invasion이 있으면 예후는 나빴습니다. 전체 ESD 중 암이 61.5%인 환자군입니다. 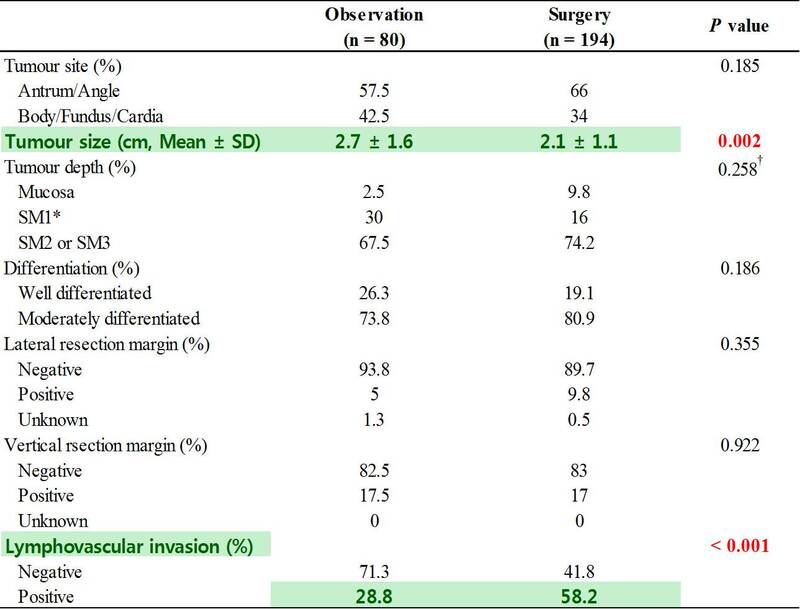 655예 중 83예(12.7%)에서 lymphovascular invasion 혹은 posotive vertical margin이었습니다. 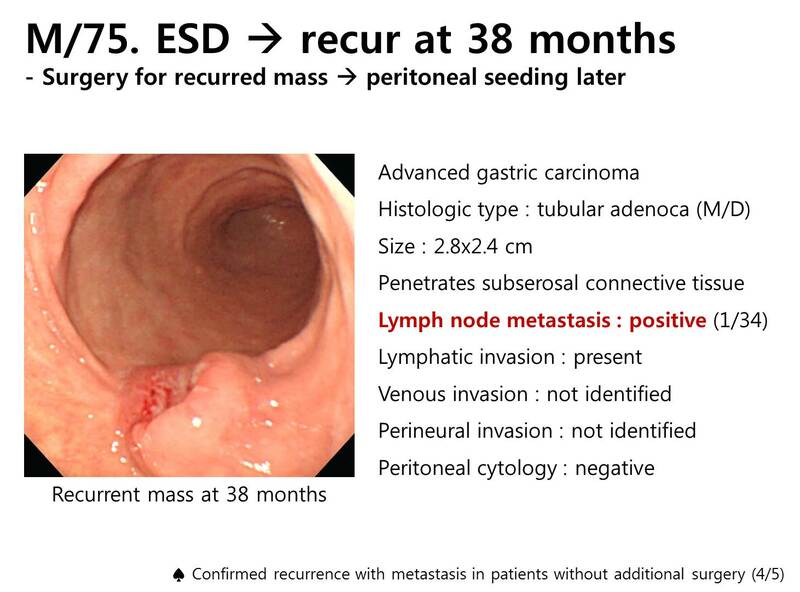 Deep SM invasion이나 undifferentiated type이 어느 정도였는지 자료가 없어서 curative resection rate는 알 수 없습니다. LV invasion이나 positive vertical margin으로 인하여 명백히 수술이 필요한 환자 83명 중 45명(54.2%)이 수술을 받았습니다. 수술한 환자 중 7명(15.6%)에서 림프절 전이가 있었습니다. 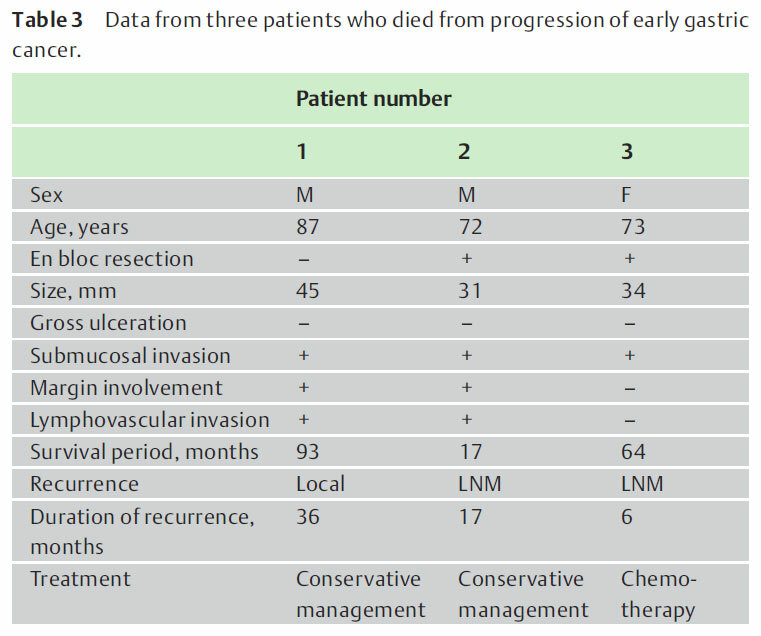 Three (6.7 %) of the 45 patients in the surgical group exhibited recurrence. 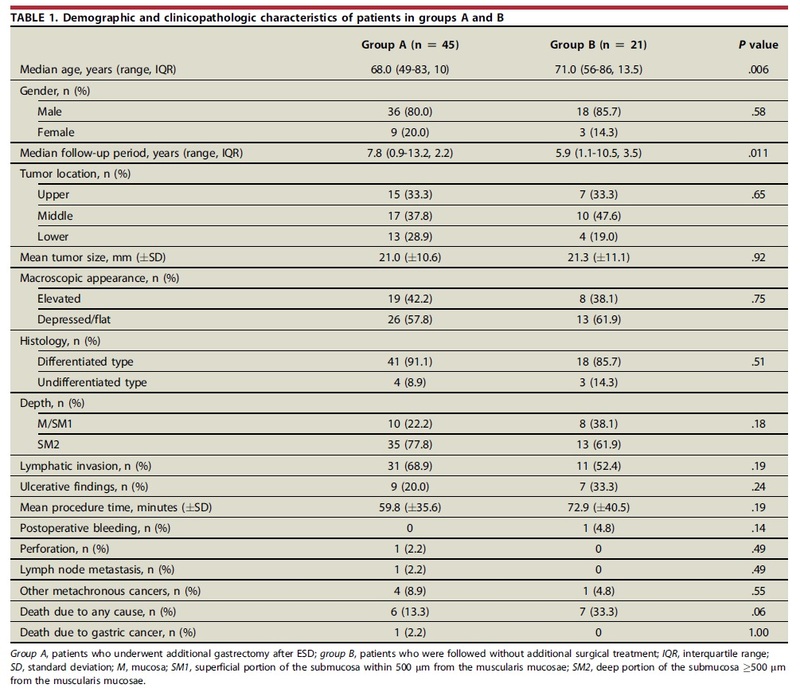 Table 3 shows the characteristics of the 3 patients. 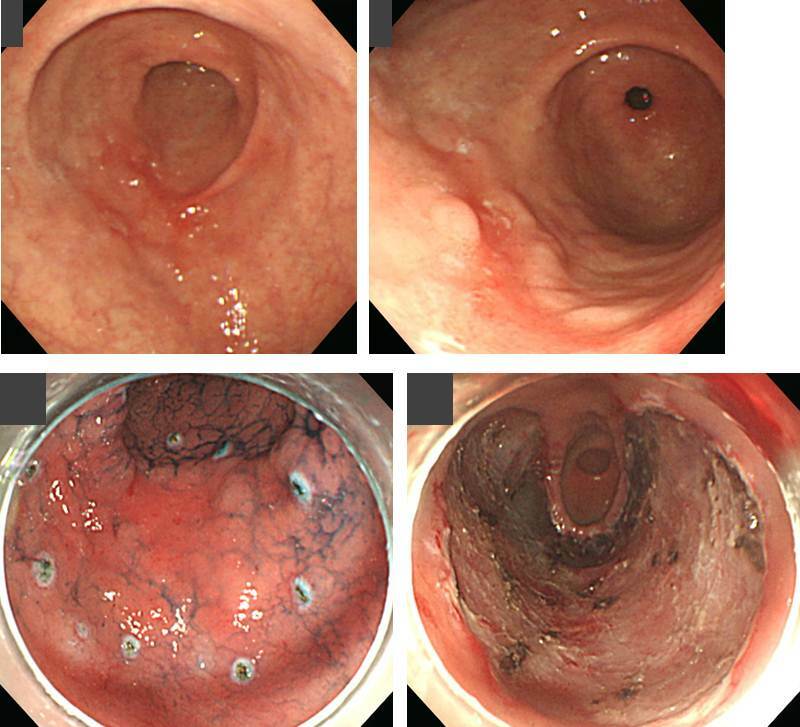 All 3 patients exhibited deep submucosal (SM) invasion of more than 0.5 mm and a positive vertical margin after ESD, with one of the patients exhibiting accompanying lymphovascular invasion. 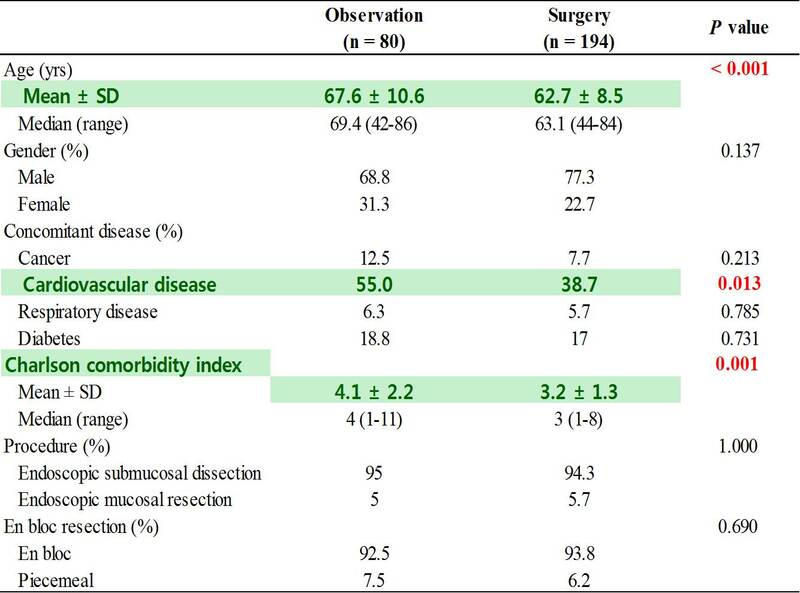 All had undergone subtotal gastrectomy, and recurrences were detected at 12.0, 12.8, and 25.0 months during the close surveillance period after surgery. 위암 ESD 후 수술을 한 환자가 간혹 재발을 보일 수 있습니다. 원자력병원에서는 3명(림프절 전이가 있던 사람 중 1명, 림프절 전이가 없던 사람 중 2명)에서 재발이 있었습니다. ESD 후 수술한 환자의 재발률이 6.7%였습니다. ESD 후 수술까지 했는데도 재발한 환자가 한 분 계셨습니다. 처음부터 '다소 무리다' 싶은 환자에서 수술 후 재발을 하는 것 같습니다. ESD 적응증을 잘 지키는 것이 최선의 방책 아닌가 생각합니다. 4) 2016년 순천향대학교 부천병원 (Han JP. Surg Endosc 2016). Non-curative resection 증례를 4군으로 나누었는데 3군과 4군의 local recur 위험이 높았습니다. 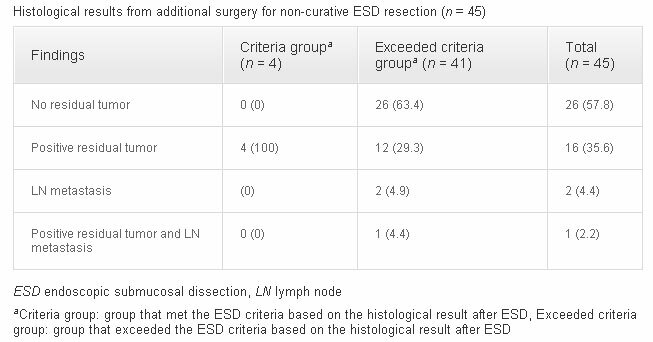 Of 152 non-curative resections, 46 (30.3 %) were stratified as Group 1 (incomplete resection and met the ESD criteria), 31 (20.4 %) as Group 2 (complete resection and exceeded the ESD criteria), 41 (27.0 %) as Group 3 (incomplete resection and exceeded the ESD criteria), and 34 (22.4 %) as Group 4 (lymphovascular invasion regardless of complete resection). 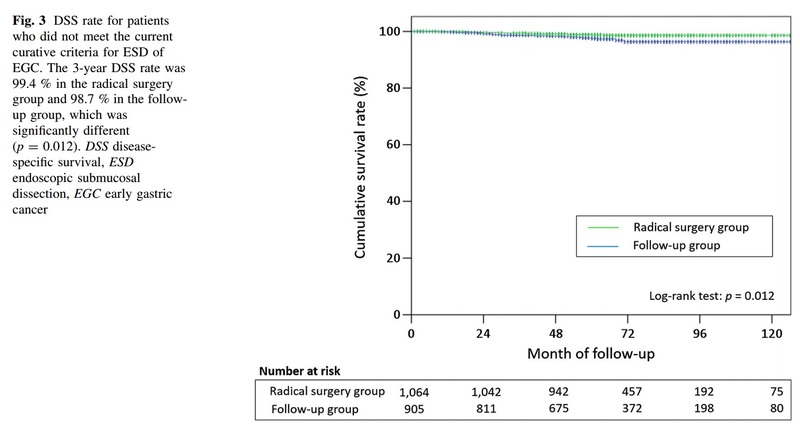 Group 3 [odds ratio (OR) 3.991; p = 0.015] and Group 4 (OR 4.487; p = 0.014) had higher rates of local recurrence after non-curative resection. 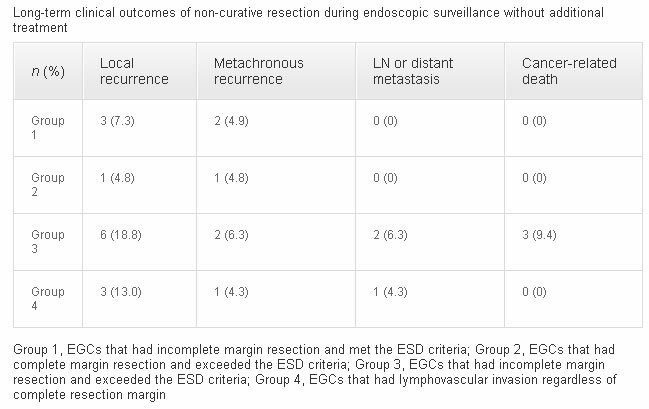 In those high-risk groups, endoscopic surveillance without additional treatment detected significantly more local recurrence than in those receiving additional treatment (p = 0.029). Non-curative 152명 중 35명(23.0%)는 follow-up loss 되었고, 14명(9.2%)은 추가 내시경치료를 받았으며, 40명(26.3%)은 rescue surgery를 받았습니다. 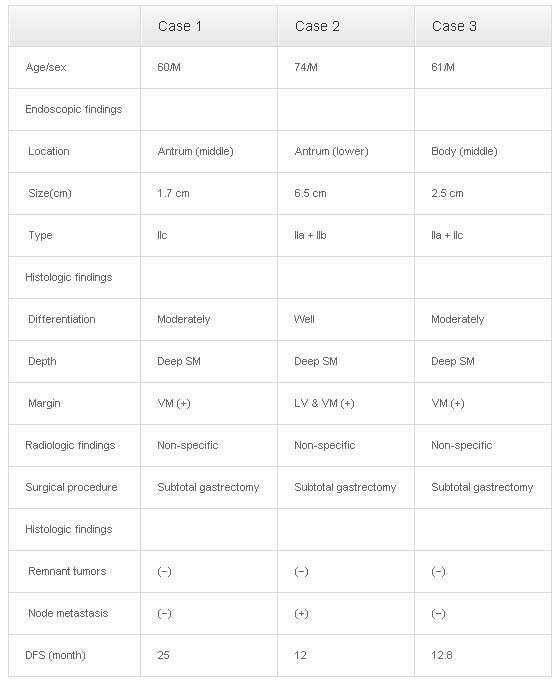 흔히 rescue surgery의 definite indication으로 생각되는 Group 2, 3, 4 환자 중 자료수집이 가능한 76명 중 수술은 38명(50.0%), 추가내시경 치료는 4명(5.3%), surveillance는 34명(44.7%)이었습니다. 추적관찰 성적은 아래 표와 같았습니다. Cancer-related death가 추적관찰 34명 중 3명(8.9%)이었습니다. 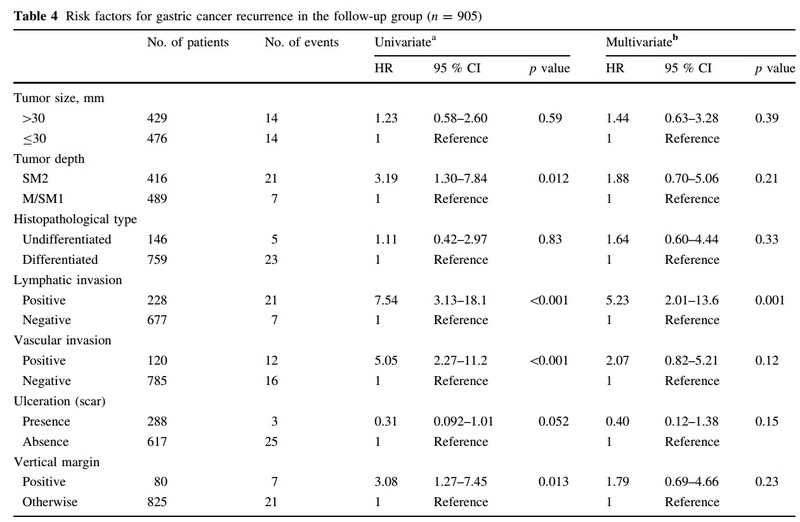 이 정도의 cancer-related death는 수술이 꼭 필요한 환자에서 수술을 하지 않으면 5 year survival rate가 10% 정도 낮아진다는 삼성서울병원의 결과와 비슷한 수준입니다. ★ ESD는 적응증이 아니면 아무리 환자가 원해도 하면 안되는 그런 시술입니다. 2010년과 2011년 사이 국내 다기관에서 등록된 cohort의 5년 추적 결과입니다. 대부분 예상하였던 결과였는데 제가 관심있게 본 것은 아래 두 point였습니다. Non-curative resection에서는 수술이 원칙입니다. 그러나 실제로 수술받는 환자는 절반에 불과합니다. 비단 non-curative resection 환자군만 아니라 curative resection 환자군에서도 distant metastasis가 발생합니다. Elderly를 대상으로 한 연구였기 때문인지 수술군과 비수술군의 차이가 현저하였습니다. Noncurative resection 165예를 분석하였습니다. 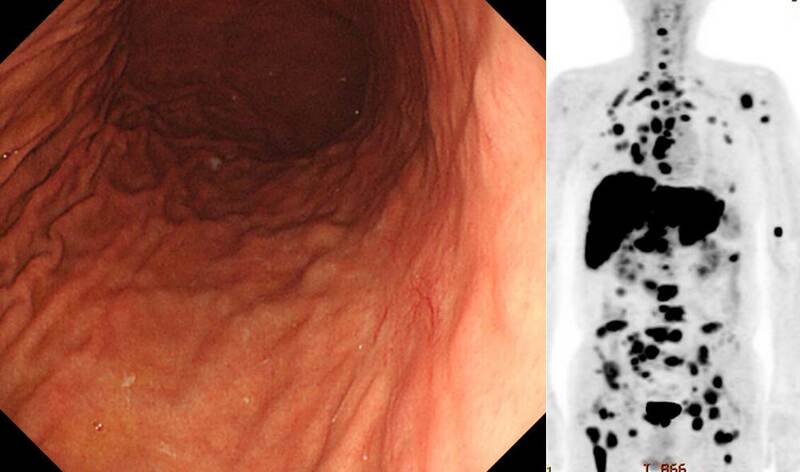 Lymphovascular invasion 양상을 ESD indication group에 따라 나눈 점이 흥미로웠습니다. 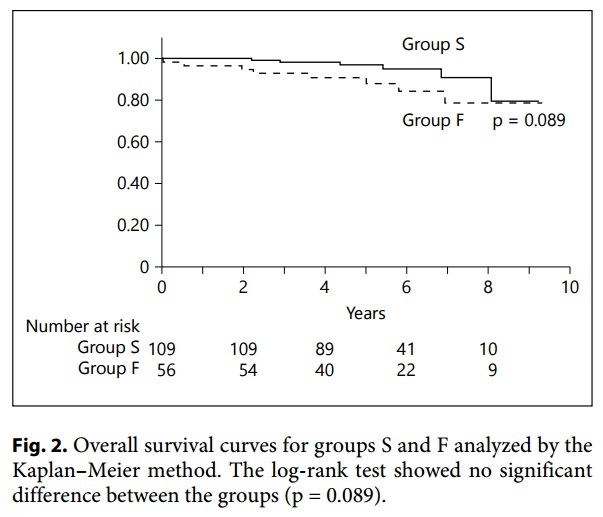 Surgery group (Group S)과 follow up group (Group F)의 비교입니다. Lymphatic positive라도 deep resection margin이 음성이고 SM2면 추적관찰 할 수 있다는 내용인데... 다소 우려스럽습니다. 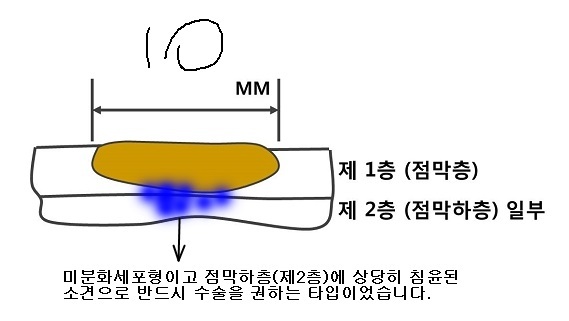 Sample size가 너무 작기도 하고. 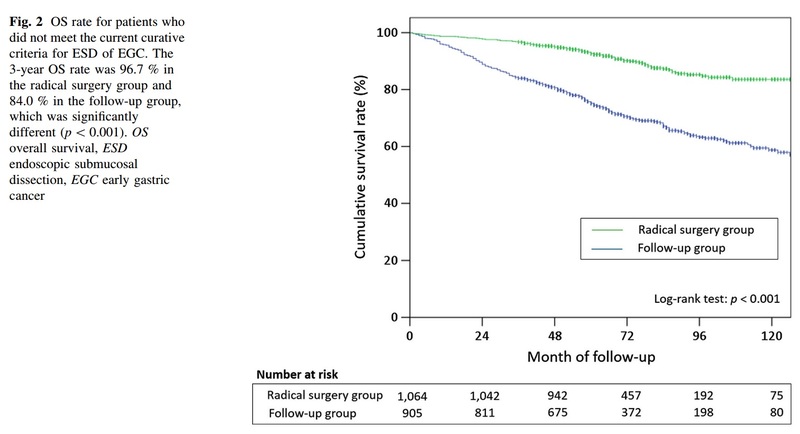 RESULTS: Overall survival (OS) and disease-specific survival (DSS) were significantly higher in the radical surgery group than in the follow-up group (p < 0.001 and p = 0.012, respectively). However, the difference in 3-year DSS between the groups (99.4 vs. 98.7 %) was rather small compared with the difference in 3-year OS (96.7 vs. 84.0 %). 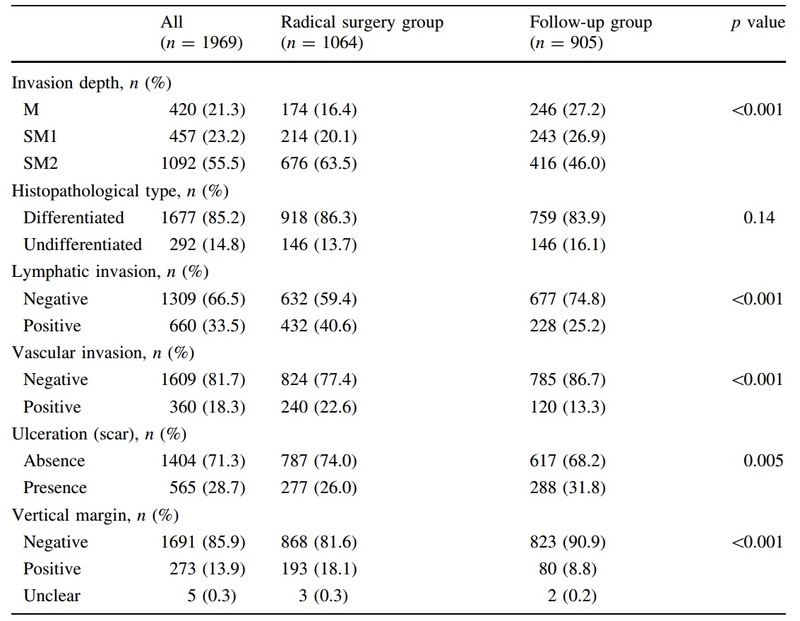 LNM was found in 89 patients (8.4 %) in the radical surgery group. 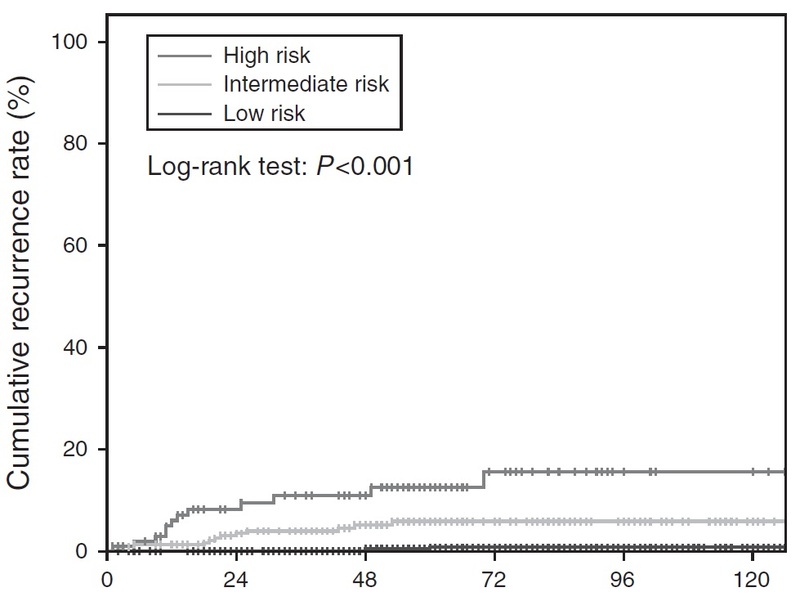 Lymphatic invasion was found to be an independent risk factor for recurrence in the follow-up group (hazard ratio 5.23; 95 % confidence interval 2.01-13.6; p = 0.001). CONCLUSIONS: This multi-center study, representing the largest cohort to date, revealed a large discrepancy between OS and DSS in the two groups. 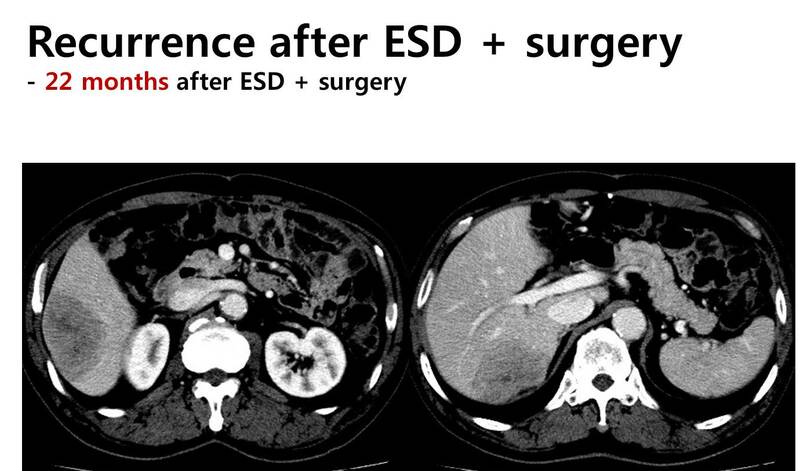 Since follow-up with no additional treatment after ESD may be an acceptable option for patients at low risk, further risk stratification is needed for appropriate individualized treatment strategies. 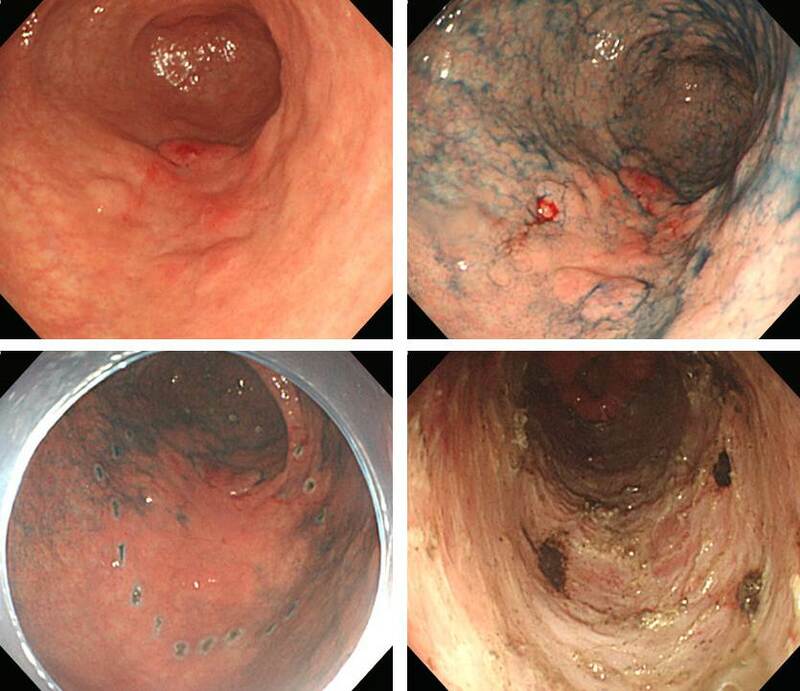 Hatta W. J Gastroenterol 2016 논문의 마지막은 다음과 같았습니다. 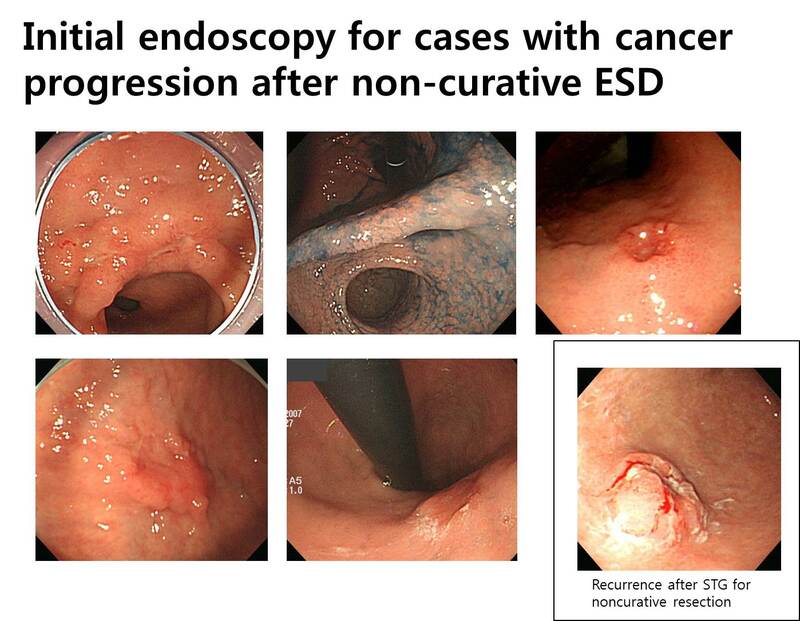 "Although radical surgical resection is currently indicated for these patients, we suggest that follow-up with no additional treatment after ESD may be an acceptable option for patients at low risk. 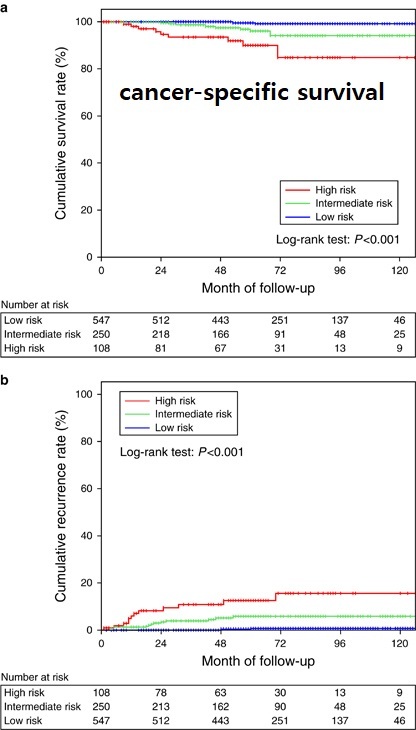 Consequently, further risk stratification is needed for appropriate individualized treatment strategies." Gotoda 선생님께서 KINGCA 2016 강의에서 소개한 eCura system입니다. 다른 위험인자보다 lymphatic invasion에 3배의 가중치가 주어졌습니다. 국립암센터 엄방울, 국명철 선생님 팀에서 림프절 전이 nomogram을 발표하였습니다 (Eom BW. PLoS One 2016). 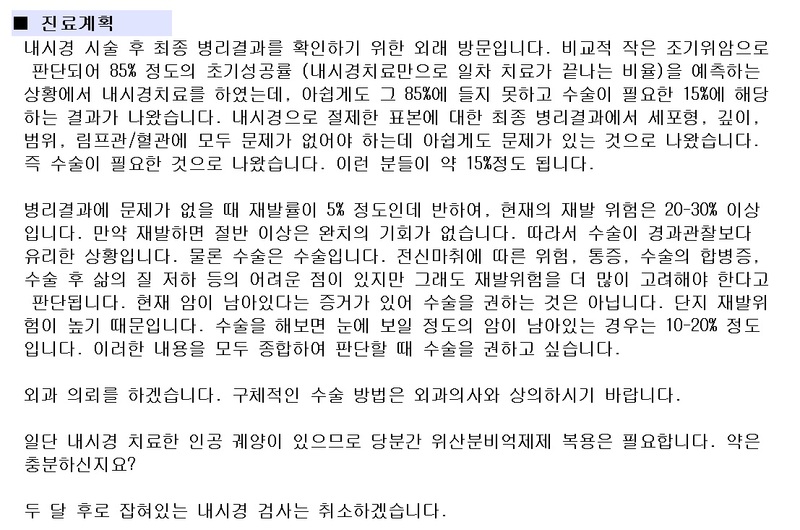 ESD 후 수술이 필요한 환자에서 보다 정확한 숫자를 제시하며 치료 계획을 논할 수 있다는 점에서 유용하다고 생각됩니다. 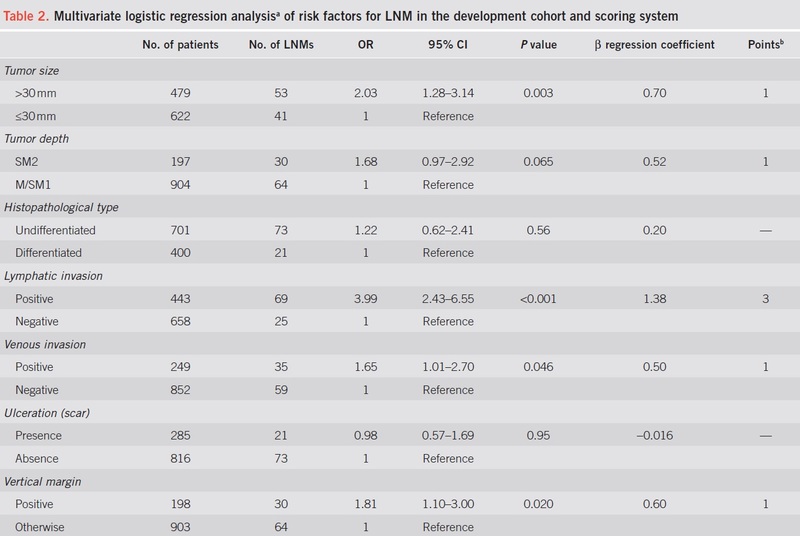 In previous studies, the seven biomarkers were proved to be associated to lymph node metastasis in gastric cancer. 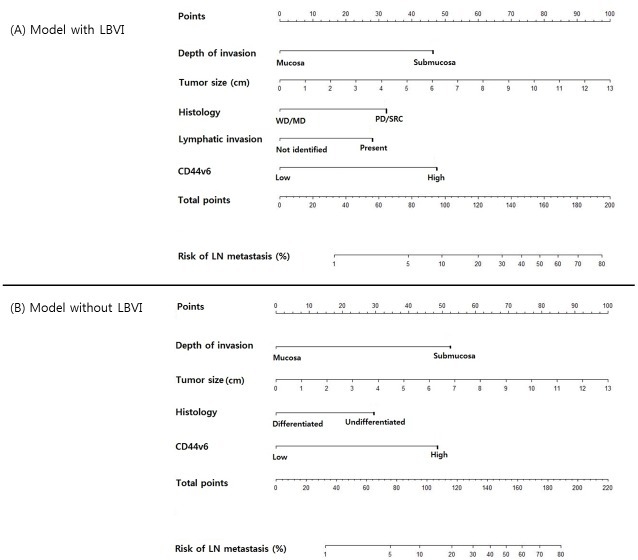 However, in this study, E-cadherin, α1 catenin, p53, EZH2 had no relationship with lymph node metastasis, and Annexin II and PRL-3 had little discrimination in the immunohistochemistry. 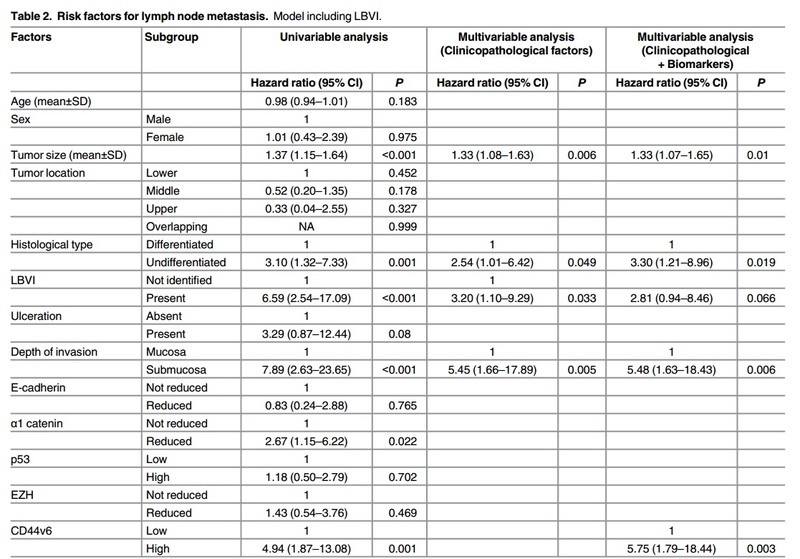 CD44v6 was the only significant risk factor for lymph node metastasis, and its OR was very high similar to depth of invasion. 2017년 환자 중 불완전 내시경 절제술 후 위절제술을 받지 않는 분이 12명이었습니다. 이를 간략히 분석하였습니다. 궁금한 점이 있어서 질문드립니다. M/58, 동반질환 없이 건강한 환자로 전정부의 EGC, IIc+IIa, 15x10mm with erosion 병변에 대해 ESD를 시행했습니다. 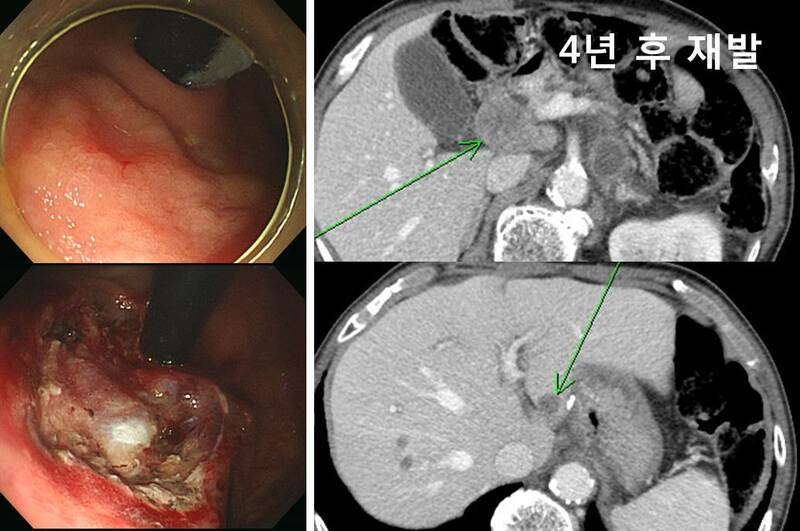 병리 결과는 Adenoca, M/D, Lateral/Deep RM (-/-), Complete resection, LVI (-), Sm cancer, 700 um invasion 이었습니다. 다른 병리 소견이 모두 양호한 소견인데, depth of invasion이 500um을 넘을 때 어떻게 추가 치료나 추적을 권유하고 계시는지 궁금합니다. 혹시 예외를 적용하시는 경우가 있으신지가 특히 궁금합니다. 원칙이 아니라, 실제로 다른 교수님들은 어떻게 하고 계시는지, 예외는 없는지가 갑자기 궁금해졌습니다. SM 500 um을 초과하는 점막하침윤의 경우는 예외없이 수술을 권합니다. 저는 단순한 것을 좋아합니다. 아주 소수의 단순한 원칙을 예외없이 적용하는 것을 좋아합니다. 사례별로 보면 아쉬운 점이 없지 않겠지만... 전체적으로 보면 단순한 원칙을 지키는 것이 유리하기 때문입니다. 550 um invasion이라고 보고된 결과를 바탕으로 수술을 권한 적도 있습니다. 3-4년 전 간이식을 받으시고 이번에 위암이 발견되어 ESD를 하였으나 SM invasion 500 um, lymphatic (++)인 환자에 대하여 수술을 고민중입니다. 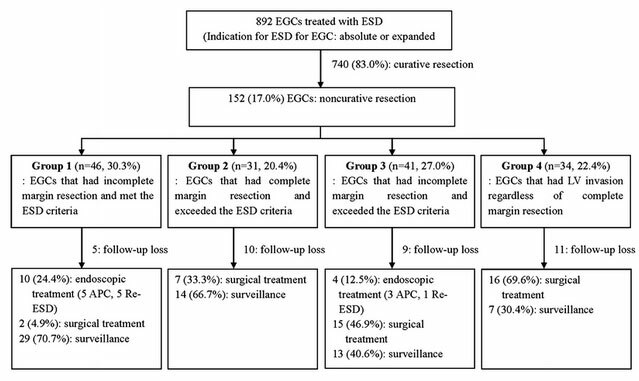 일전에 소개드린 바 있지만 ESD 후 incomplete resection 인 경우에 수술하지 않은 환자에서 종종 의미있는 재발이 발견되고 있습니다 (링크). 따라서 수술을 권하는 것이 표준이라고 생각합니다. 실제로 수술을 권해보면, 대강 80-90%는 수술을 방으시고 10-20%는 수술을 받지 않습니다. 저희 병원 데이타를 보면 70% 환자가 수술을 받는 것으로 되어 있지만 (링크) 이 중에서 일부는 내과에서 수술을 권하지 않은 환자이므로 실제로는 수술을 권하면 80-90% 이상의 환자분들은 수술을 받습니다. 문제는 수술하지 않는다고 다 재발하는 것은 아니라는 것입니다. 대강 survival을 구해보면 수술이 필요한데도 수술하지 않은 경우의 5년 생존율은 80% 정도입니다. 물론 돌아가신 분이 전부 암으로 돌아가신 것은 아닙니다 (링크). 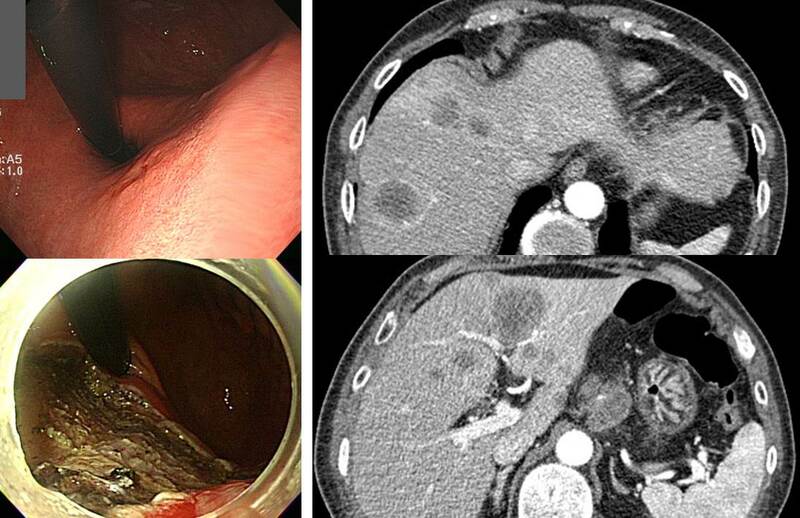 재발위험을 예측하는 여러 인자 중 depth of invasion과 lymphatic invasion이 중요하다고 생각합니다. 특히 lymphatic invasion은 매우 중요합니다. 재발이 확인된 환자의 대부분에서 lymphatic invasion이 있었기 때문입니다 (링크). 또 다른 고려점은 수술한다고 모두 재발하지 않는 것도 아니라는 것입니다. 증례는 많지 않지만 ESD 후 incomplete resection으로 수술하음에도 불구하고 다발성 재발을 보인 경우도 있었습니다 (링크). 따라서 많은 것을 고려하여 결정할 수 밖에 없다고 생각됩니다. 환자의 선택도 중요합니다. 그래도 여하튼 설명을 한다면 이렇게 하는 것이 최선이 아닐까 싶습니다. "조기위암으로 나와 85% 정도의 초기성공률 (내시경치료만으로 일차 치료가 끝나는 비율)을 예측하는 상황에서 내시경치료를 하였는데, 아쉽게도 그 85%에 들지 못하고 수술이 필요한 15%에 해당하는 결과가 나왔습니다. 표준치료는 수술입니다. 위를 2/3정도 절제를 하고 주변 림프절까지 치료하는 것인데, 재발률을 낮추는 가장 좋은 방법입니다. 물론 작지 않은 수술입니다. 수술에 따른 위험성도 고려해야 합니다. 특히 환자분의 경우는 과거 간이식을 받았으므로 수술의 고위험군입니다. 수술하지 않는 경우 위암의 재발률은 명확한 자료는 없지만 대강 20-30% 정도일 것으로 추정하고 있습니다. 정답이 있을 수 없는 상황입니다. 환자분의 선택이 중요할 수 밖에 없습니다. 모든 의학적 결정의 원칙은 하나입니다. " 의료진은 환자에게 최대한 자세한 정보를 제공해 드리고 최종 결정은 환자의 판단에 따른다"가 그것입니다. 만약 저에게 하나를 선택하라고 하신다면 저는 수술을 권하겠습니다. 물론 의사마다 다른 선택을 할 수 있는 상황이라는 것도 이해하여 주시기 바랍니다." 수 년 전 조기위암 내시경 치료 후 병리학적으로 deep SM invasion과 lymphatic (+)로 수술받은 환자가 외래에 오셨습니다. 문득 아래 기사를 보여주시면서 "그 때 수술하라고 듣고 무척 속상했는데, 지금 생각해보니 참 잘 한 결정이었던 것 같습니다. 고맙습니다. "라고 하셨습니다. 위암(胃癌)을 내시경으로 제거했을 때 4년 안에 암이 재발할 확률이 수술로 제거했을 때에 비해 2배 이상 높다는 연구결과가 나왔다. 대구 계명대 동산병원 소화기내과 연구팀은 내시경 시술을 받은 위암 환자 514명과 위 절제술을 받은 위암 환자 686명을 약 4년 간 추적 관찰했다. 그 결과, 내시경으로 위암을 제거한 환자의 2.4%가 관찰 기간 내에 위암을 다시 진단받아 재수술을 받아야 했다. 위 절제술의 경우 1.1%에 그쳤다. 이런 저런 생각이 들었습니다. (1) 그렇게 자세히 설명해 드려도 시큰둥 하시더니 활자화된 기사의 힘은 막강하구나... (2) 재발률이 높다는 것의 의미를 환자는 어떻게 파악하고 있을까? 재발률이 낮은 치료가 꼭 좋은 치료가 아닐 수 있다는 것을 환자는 이해할 수 있을까? (3) 만약 재발률이 2%라고 한다면 수술을 해야 할지 말아야 할지 reasonable 하게 결정하실 수 있을까? (4) 재발률 2%를 막기 위하여 지금 수술을 한다면 환자는 수술에 따른 mortality에 노출된다는 것을 어떻게 받아들이실까? (5) 재발하여 사망한다면 5년 후이고, 수술받다 죽으면 이번 달인데, 둘 사이에서 균형된 결정을 내리실 수 있을까? 언론 의료정보는 참 허망하다고 생각합니다. 나름 정보를 제공하지만 받아들이는 사람은 제멋대로인 것이 언론 의료정보입니다. 의사에게 충분히 설명할 수 있는 시간을 만들어 주는 것이 우리나라의 의료발전 아닌가 생각합니다. 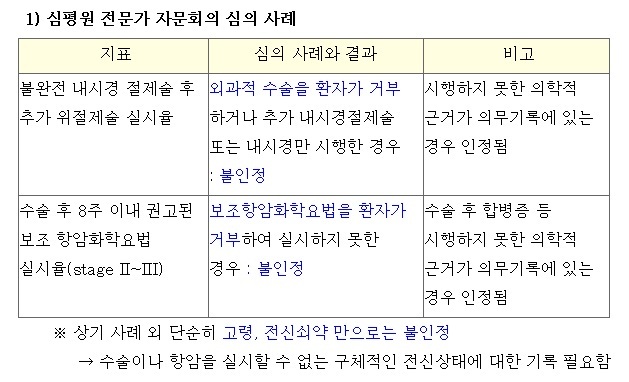 최소한 15분 진료가 필요합니다. 오전 외래 12명 시대를 기대합니다.